Our final Sikkimese evening, I was filled with quiet optimism that nighttime showers would strip the mountain of its watery burqini, perfect for some narratively fulfilling photos before our jeep back down to the plains and the plane. Alas, things took an exciting turn. Other than garrulous intellectuals, sweets, and fish, one of the things West Bengal is famous for is a charming propensity to go on strike at the drop of an outraged hat. In this (sub)national sport, the British can barely manage to disrupt a 17-minute boat race—our last proper general strike was in 1926—but the Bengalis make the French look like chinless Stakhanovite scabs. Bengal enjoys around 50 total shutdowns or bandhs occur each year, lasting between two hours and two days. With a sigh, people down tools/crayons/autos, halfheartedly set fire to a few buses and then, observation suggests, go off and play cricket. Imagine a decade-long Winter of Discontent but in, er, glorious summer. 19:00HRS Relaxing over Kingfishers and noodle soup, we overhear discussion of a bandh for the next day. Usually around Darjeeling these are called to demand an independent Gorkhaland for the ethnic Nepalis, but surreally this one was an anti-Gorkhaland, anti-anti-Government of Bengal protest, allegedly spearheaded by Siliguri town’s large population of Bangladeshi refugees. 19:06 Cue mad late-night negotiation for jeep tickets, a slightly unsober dash to pack, and a dramatic standoff with the ovine staff of our overpriced hotel, the Elgin, culminating in Hannah’s fist-thumping demand to talk to the Oberoi family and a lot of money back. ‘This is the most fun I’ve had all trip!’ she says brightly. 19:45 It emerges that the other jeep passengers desperate to escape a life of yak servitude require a multi-course meal to settle their nerves. 21:30 Finally, a thrilling car chase back down the hills. If you think single-lane, zigzagging, quasi-dirt-track, clifftop journeys are a hoot normally, you should try it in the dark, through dense fog and rain, with a pounding Bollywood soundtrack and a heavily perspiring driver yelling into the phone as he swerves 180° one-handed over a 1000-foot drop. I retreat into terrified narcolepsy. 03:30 We arrive in Siliguri, an utterly hideous nowheresville, to find that our hotel’s 24-hour reception was a sadistic illusion. The only sign of life is a pack of gigantic black hogs so large I at first thought they were hippopotami, swaggering along the main road and eyeing us ravenously. Jeep Bloke suggests we walk off to find a hotel. 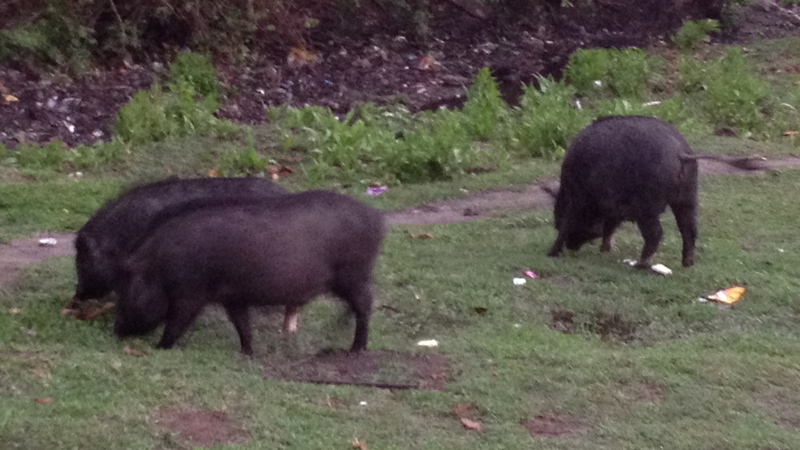 ‘There is nothing in this town,’ I tell him slightly hysterically, ‘except gigantic black hogs.’ He backs away nervously. 04:00 We jeep a bit further to the equally hideous train station a few miles away. The Jeep Blokes are lovely and help us to find a hotel, refusing a tip—‘Just be friends to Sikkim’—which leaves us unnerved but grateful. The room has a toilet but no sink, evidence of someone’s hastily abandoned evening meal, and appears to turn into a tambourine-rattling Hindu temple at the crack of dawn, but we sleep. 24 hours of boredom follow, but at last we escape back into Delhi’s metallic jaws. * Well might she ask. 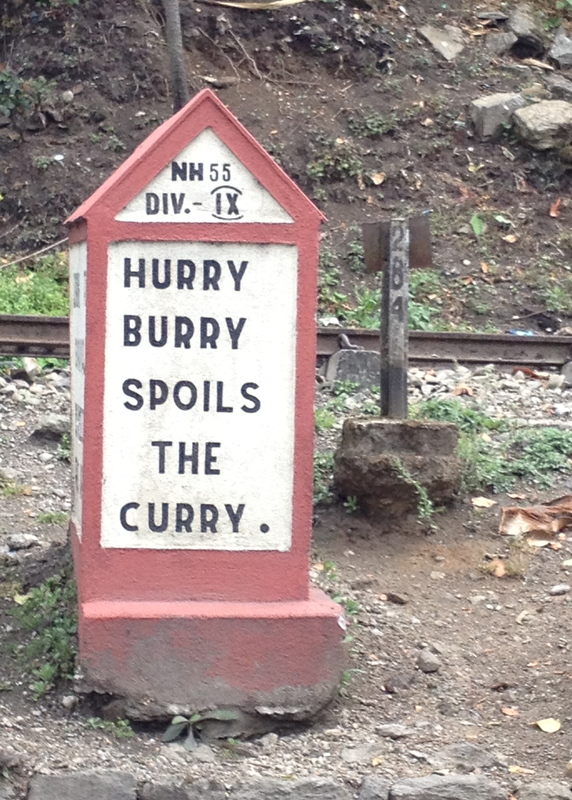 As I noted when rambling about Hinglish, India has its own indecipherable protest vocabulary. I am 83% sure a bandh is a shutdown typically called by political parties, whilst a hartal is basically the same but with more Bambi-eyed Gandhian overtones. In a gherao protesters encircle an illustrious personage until their demands are met, whilst a bhukh hartal or a dharna means publicly fasting until the offender gives in (though actual fasting to the death is very rare). The Delhi bourgeoisie is merrily inconsistent in seeing such techniques as anti-democratic blackmail when used by people they don’t like (autorickshaw drivers, trade unionists, other uppity plebs), and a noble, principled stand when used by state-bashers they do (high-handed anti-corruption activist Anna Hazare). Another grim but high-profile form of protest is suicide, most directly in the form of self-immolation, though also notoriously the last resort of debt-ridden Indian farmers. On 26 March alone, a Tibetan set himself on fire near India’s parliament in advance of Hu Jintao’s visit, and an auto driver did the same down in Andhra Pradesh to demand a new state, Telangana. According to my jolly December bedtime reading, self-immolation is most common in democracies. Unlike strikes and sit-ins—or their sinister distant cousin, suicide bombing—it relies upon an audience and sympathy for effect rather than simply causing economic harm. It is also easily imitable even for individuals with very few resources, which is why it appears in waves. On that merry note… belated Happy Bengali New Year!